“And They Came As An Army” from Christian Faith Publishing author Jenni Kebler is a story of mother and daughter and their unexpected journey of faith as they make their way across America. “And They Came As An Army”: a story of faith and friends as a trucking duo makes their way across America to deliver cargo. 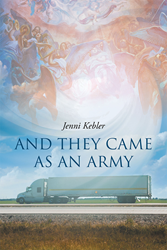 “And They Came As An Army” is the creation of published author, Jenni Kebler, a truck driver with a passion for writing, Kebler is inspired by the many things that the author has experienced traveling across the country. Published by Christian Faith Publishing, Jenni Kebler’s new book takes readers on a journey across America as a trucking duo works their way to their Canadian destination, learning something about themselves along the way. A personal story between mother and daughter and their faith, this book takes readers into the shows of the protagonists as they complete their journey. The story Kebler weaves shows the importance of God and how faith works in mysterious ways. View a synopsis of “And They Came As An Army” on YouTube. Consumers can purchase “And They Came As An Army” at traditional brick & mortar bookstores, or online at Amazon.com, Apple iTunes store, Kobo or Barnes and Noble. For additional information or inquiries about “And They Came As An Army”, contact the Christian Faith Publishing media department at 866-554-0919.